This is our seventeenth year as a fine art print studio. Our 44 inch state of the art inkjet printers offers archival quality prints for artists, photographers and designers on a variety of art media, including fine art and poster papers. We are color experts and offer the highest quality to maintain your artistic vision. This is our twenty-third year offering restoration. We offer museum quality digital restoration of faded or damaged photograph in black and white and color. We are the premier provider in the country for damaged historic documents. Although our restoration is digital we also offer help on stabilizing and preserving fragile and damaged original documents and photos. We are also dealers for archival supplies to preserve your photos and documents. David Husom and Ann-Marie Rose are both accomplished artists. Husom's photographs are in a number of museum collections including large collections of his work at the Getty Museum in Los Angeles, the Weisman Museum in Minneapolis and the Minnesota History Museum in St. Paul. Rose was a recipient of an Arts Midwest - National Endowment for the Arts Fellowship for her work in digital imaging. Husom and Rose have exhibited extensively throughout the country and in Japan both together and individually. Copyright © 2019 Husom & Rose Photographics. All Rights Reserved. Art work copyright by David Husom 1976.
in 1976 while consulting with 3M on imaging products David Husom became aware of a new process called "Scanmurals" that utilized one of the world's first inkjet printers to produce billboard sized images on heavy fabric. He realized the potential of using it to reproduce some of his photographs at large scale. He created three works that were exhibited the following year in a one person exhibit at Hanson-Cowles Gallery in Minneapolis. Two of the works were 5X8 feet and one was 3.5X5.5 feet. 1984 Ann-Marie Rose was teaching graphic arts prepress at a technical college. Having access to early highend drum scanners she scanned her 8X10 black and white negatives and combined halftone film with hand coloring of print proofing materials. Works from this series were exhibited in Japan in1985. in 1985 David started including computer imaging in his intermediate level photography courses he taught at the University of Minnesota after convincing the computer lab to buy a Thunderscan, the first scanner designed for Apple Macintosh computers. 1986 David & Ann-Marie formed Husom & Rose Photographics as a studio that would bridge the gap between photography and the graphic arts. 1989 Ann-Marie output 8X10 stochastic film from a drum scanner and enlarged the negatives to mural size on black and white photographic paper. The images were then hand colored using Marshall Oils. 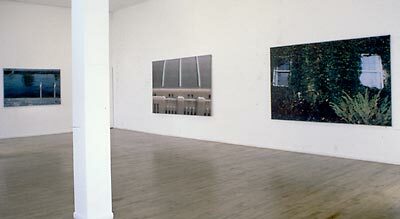 Works from this series were exhibited in Minneapolis in 1989 and 1990. 1990 David and Ann-Marie were among the very first to receive a new imaging program from Adobe—Photoshop 1.07. They created a tutorial on how to use the program that became one of the first items to be available for download on a new online service the following year—AOL. 1991 David was the chair of Second Generation Original: Digital Photography in the 90's conference hosted by the University of Minnesota. It was one of the first conferences in world to look at digital photography for artists and commercial photographers. He also curated the first exhibition in the Midwest of digital art and spoke on digital imaging at the Society for Photographic Education's national conference in New Orleans. That year in his own work he used a Dicomed workstation and a 4x5 film recorder to create a series of digital composites that were exhibited in Minnesota in 1991 and Arizona in 1992. 1991 Husom & Rose acquired their first scanners: a Leaf 4X5 film scanner and a Microtek flatbed. Ann-Marie started outputting her digital scans to an Iris Inkjet printer. At the time there were only a handful of service bureaus using Iris for fine art printing; she worked with a printer in Iowa. On one of her visits to the lab the owner announced: "someone has just named this process we are doing; they call it Giclee printing." The works were exhibited in Arizona and Minneapolis in 1992. 1992 Husom & Rose released Digital Photographics CD-ROM. It was not only one of the first royalty free CD's of high quality photographic images, but it was also a training resource in digital imaging and Photoshop used by colleges and schools around the world. 1995 As a consultant and trainer for Dicomed, David tested and used the first digital camera to exceed 4X5 film, the Dicomed Scanback. Today it is known as the Better Light and it is still one of the finest digital camera backs made. 1996 Husom & Rose were the first in Minnesota to acquire an Epson Stylus 800, the first color inkjet printer that rivaled photographic prints. The 800 was the first inkjet printer that used Micro Piezo technology, now the standard in all Epson inkjet printers. 1997 David and Ann-Marie received a grant from the Jerome Foundation to create a virtual tour of the Blacklock Nature Sanctuary in Northern Minnesota using digital cameras. 2002 They acquired their first wide format 44 inch Epson printer for digital printing. 2003 David appeared on Tech Talk, a Public Television program to talk about digital cameras. 2005 They added a second wide format Epson printer. 2007 They added a new scanner– a Scitex EverSmart Pro with an astonishing 3,175 DPI true (optical) resolution for film and historic documents, photographs and images. 2008 They added a third wide format Epson printer— the 44 inch 9880. 2010 The original Epson 9600 was retired and a second 17 inch printer was added. A new flatbed scanner was added for fine art. 2011 After 11 years in this location, It was time for a major remodeling of the studio. A photo shooting area was added along with an updated gallery and conference area. The studio has a mid-century modern theme but also features new art work. 2012 More finishing options were added for Giclee prints. 2013 A 36 Megapixel high-end digital camera was added for digitizing large works of art in the studio and on location. Also, Husom received a Fellowship from the University of Minnesota to explore use of iPads and new media in photography. 2014 A new Epson 4900 17 inch roll and sheet printer was added for book projects and smaller art and photography reproductions including more paper options for photographs. 2015 The scanning area was updated with a new computer and a new scanner capable of 4800 ppi. 2016 A Manfroto Digital Director was added to aid in photographing art work. 2017 At long last it was time to retire the Leaf and Scitex scanners. They were the best in their day, but technology keeps pushing forward. A new professional film scanner capable of 9600 ppi was added for negatives, slides and small format originals needing the highest quality of any scanner on the market. 2018 Our "old" 4900 printer was replaced with an Epson Surecolor P5000, the newest generation of Epson fine art and photography printers. Additionally we added lamination and mounting equipment. This is our fourteenth year as a fine art print studio. Our 44 inch state of the art inkjet printers offers archival quality prints for artists, photographers and designers on a variety of art media, including fine art and poster papers. We are color experts and offer the highest quality to maintain your artistic vision. This is our twentieth year offering restoration. We offer museum quality digital restoration of faded or damaged photograph in black and white and color. We are the premier provider in the country for damaged historic documents. Although our restoration is digital we also offer help on stabilizing and preserving fragile and damaged original documents and photos. We are also dealers for archival supplies to preserve your photos and documents. in 1976 while consulting with 3M on imaging products David Husom used one of the world's first inkjet printers to produce billboard sized images on heavy fabric. He created three works that were exhibited the following year in a one person exhibit at Hanson-Cowles Gallery in Minneapolis. Two of the works were 5X8 feet and one was 3.5X5.5 feet. 1984 Ann-Marie Rose was teaching graphic arts prepress at a technical college. She scanned her 8X10 black and white negatives and combined halftone film with hand coloring of print proofing materials. Works from this series were exhibited in Japan in1985. in 1985 David started including computer imaging in his intermediate level photography courses he taught at the University of Minnesota. 2012 They added more finishing options for Giclee prints.